UC Berkeley is leading a $12.3 million project funded by the U.S. Department of Energy to examine the role of epigenetics in allowing plants to survive in drought conditions, an increasing concern for agriculture as the effects of climate change are felt in California and globally. UC Berkeley researchers will partner with scientists at UC Agriculture and Natural Resources, the Energy Department’s Joint Genome Institute and that agency’s Pacific Northwest National Laboratory on the five-year project, called Epigenetic Control of Drought Response in Sorghum, or EPICON. The grant, announced today (Sept. 28), comes in the midst of a historic drought in California. Over three years of field testing, researchers will dissect mechanisms by which sorghum, a close relative of corn, is able to survive water deprivation. 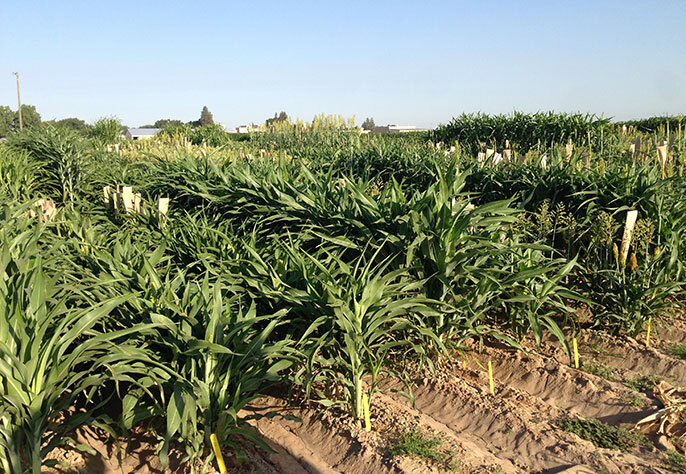 Scientists hope to learn the secrets to the sorghum plant’s tolerance to drought. Shown here is a bee visiting a sorghum flower. Peggy Lemaux, cooperative extension specialist at UC Berkeley’s Department of Plant and Microbial Biology, is heading the entire project. Co-investigators are Devin Coleman-Derr, Elizabeth Purdom and John Taylor from UC Berkeley; Jeffrey Dahlberg and Robert Hutmacher from UC Agriculture and Natural Resources; Chia-Lin Wei from the DOE Joint Genome Institute; and Christer Jansson from the Pacific Northwest National Laboratory. Over the next three years, a variety of observable plant traits will be followed, such as plant height and grain yield. In addition, leaf and root samples will be taken to investigate responses to drought at the molecular level, including how gene expression changes and which proteins and metabolites are altered. Researchers will also be tracking changes in the sorghum-associated microbial communities to determine whether they correlate with changes that directly contribute to the crop’s drought tolerance. It is now well known that associations of specific bacteria and fungi with plants and animals have positive effects on host fitness. For example, microbes in both plants and humans are known to help fight disease and, in the soil, can help deliver nutrients and other resources to plants. EPICON efforts will generate a variety of large datasets, which will be shared via an open, online platform that will include methods and results. The researchers expect that the project will allow better predictions of how sorghum and other cereal crops are affected by future climate scenarios, and will lead to approaches to improve growth and production of sorghum and other crops under water-limiting conditions in commercial fields and on marginal lands. The Energy Department’s Genomic Science Program is funding this project through its Office of Biological and Environmental Research.